This running back from Wichita, Kansas is a great one on the campus of Oklahoma State University, but no matter how good he was he would never eclipse the 1988 season that Barry Sanders had for the Cowboys. It’s crazy 25 years after Sanders there’s Joseph Randle. To some this may come as a shock but if you’ve seen him play in the BIG 12 you’d see what I see. He has quite a resume for a guy no one covering the draft (Kiper, Mayock, McShay) is talking about. People talking about Bernard, Lattimore, and Lacy, rightfully so they’re great players but I learned the game of football as doing the little things better than your opponent. He’s a 1st team All-Big 12 two years running (2011-2012), a Doak Walker semi-finalist in 2012, and had over 2,600 rushing yards over the past two seasons. Basically saying he replaced Kendall Hunter pretty well after he left the school for the 2011 Draft. 2011 was a great year for the Cowboys, Randle ran for over 1,200 yards and all while QB Brandon Weeden and WR Justin Blackmon were stealing the attention. He had 24 TDs as a sophomore in 208 carries rushing! Just to do the math he scored 33.3% of the time he ran the ball, but yet no one was talking about him. His 2012 season as a junior was better even without the passing being the greatest in the Big 12 like the previous two seasons. He ran for 1,417 yards which was an improvement, but he only reached the end-zone 14 times, and to me that’s still counts that he’s an elite back in the collegiate level. Listed at 6’1” 200lbs. he’s a bit of a tweener. He runs in the 4.5’s, he can block, he can catch, after all playing an air-raid style where throwing the ball is the focal point you need to be a complete back. With the NFL evolving to this horizontal passing game with bubble screens and read options, you want a back that has a versatile skill set. A lot have him between the 3rd and 4th round but remember who else was drafted in that spot, think of DeMarco Murray, Jamal Charles, and Stevan Ridley all have had successful careers to this point being third rounders. In comparison, I see him as what Jahvid Best was at Cal and early on for Detroit before his numerous amounts of concussions slowed him enough to probably end his career. Another fair comparison for him would be Edgerrin James the former Colts/Cardinals running back was the jack of all trades at his position, and most of all he came into the league at 6’1 216lbs, speed may be James’ advantage on Randle but the little things is what equals out. Detroit is a perfect fit for Randle and his complex skill set. Mikel Leshoure, who was drafted in the second round of the 2011 Draft can get the majority of carries, then Randle come play an Ahmad Bradshaw role, third down and two-minute offense with Stafford. This will give them a receiver out the backfield. I also like Arizona with how they can mix him with Beanie Wells, and as a Ravens fan I know Bruce Arians loves having depth at RB. But for a QB who may not be a Manning, Brady, Brees, or Rodgers, you need a group of backs to keep the defense guessing. His coach at Oklahoma State Mike Gundy was asked about a comparison in a question by the Tulsa World, he responded with Thurman Thomas, who played at Oklahoma State from 1984-87. He mention the blocking ability and compared how the two played, I feel that’s a stretch but very high praise. Eddie Lacy completes his college career as a two-time defending national champion, now onto the NFL Level. Next on my list at number four is the bruiser tailback from the two-time defending national champion Alabama Crimson Tide. Yes I’m talking about Eddie Lacy. Talk about a guy who could run you over, but he’s only 6’1″ 220lbs (I would argue he’s way more than that). But regardless he runs hard and like Mark Ingram and Trent Richardson and way back with Shaun Alexander before him he fits everything the Tide fans want. Like those three he doesn’t waste much time behind the line of scrimmage. He picks a hole and simply runs straight, after all Barrett Jones basically did all the work for him before the play, and AJ McCaron is flawless with the exchange. In other words he’s definitely not a dangler. 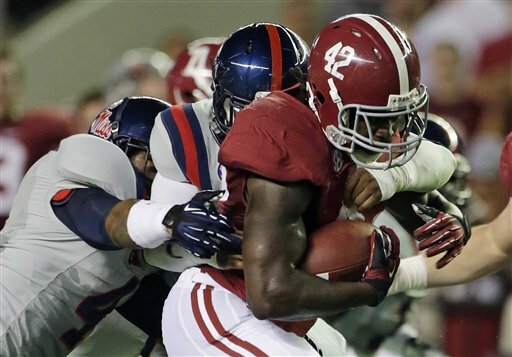 Although he did ran for 1,322 yards and 13TDs as a junior this past season, splitting time with freshman phenom TJ Yeldon. He’s not flashy, he’s not graceful, he’s vintage like John Riggins or Otis “OJ” Anderson in the days of roc’ em soc’em football. He is better than fellow 2013 NFL Draft power back LaVeon Bell from Michigan State. It’s not because of the SEC factor cause most SEC backs struggle in the NFL (Moreno, Ingram, Hardesty etc.) there are exceptions and that is Arian Foster, and Lacy would benefit in a system like Houston with Kubiak a mastermind offensively and he could do what Doug Martin did this season. Bell on the other hand is a bit slow although he may be stronger. He was in my eyes the offensive player of the game in the SEC Championship Game with his consistent carries eventually leading to 181 yds. on 20 carries with 2TD vs Georgia, and it continued in the National Title Game rout against Notre Dame. We all know Alabama has three potential first round picks on their offensive line with C Barrett Jones, G Chance Warmack, and T DJ Fluker. But think of the SEC as a league where if you lose the battle at the line of scrimmage, you can’t win. This includes running the ball in which Lacy was a major red zone go to guy for them, he capped off those long drives with TDs. To my belief, his stock is in the 2nd-3rd round range, but some have gone as far to say that teams believe he’ll wind up being the first running back taken in the 2013 NFL Draft. I certainly feel he’s somebody you can pair with somebody as opposed to making him a feature back, though I feel he will be effective. Not at a pro-bowl 1,500 yd level but maybe as a Green-Ellis type where he may not be the ideal choice but definitely more than manageable. As far as perspective teams I’m leaning with the St.Louis Rams, Pittsburgh Steelers, and the Dallas Cowboys. For the St. Louis Rams I know that Jeff Fisher would like to be able to trade Steven Jackson, the same way the Cincinnati Bengals were able to trade Corey Dillon in 2004. If so, Daryl Richardson a former 7th round pick would need some assistance, that could be Lacy, and we all know how much Fisher loved Eddie George when he coached the Tennessee Titans. 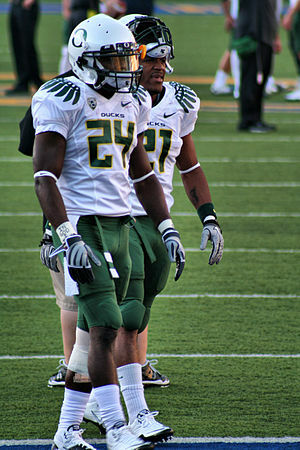 Lacy would benefit in a system like Pittsburgh greatly, they appreciate the style in which he plays. They miss Jerome Bettis, and for the older fans Franco Harris. But my main reason is Rashad Mendenhall. He may not be able to carry the load as heavy as they once thought when they drafted him back in 2008 with all the injuries and fumbles . Last but not least the Cowboys, and what a blunder this turns out to be. They have a glamour boy in Felix Jones, who can’t stay healthy for more than 8 games a year and they have DeMarco Murray who simply can’t stay healthy cause of his awful pad level. Lacy becomes the power back they’re desperate for and in time this is a wise investment for the salary cap ridden Dallas Cowboys. My NFL player comparison for Eddie Lacy would be a mix of three guys Jamal Lewis, Peyton Hillis, and former Kansas City Chief Larry Johnson. Now hear me out on this all three of those backs won’t certainly blow you away, but they all get the tough yards, battle on those short-yardage plays and they also finish on the goal line particularly around the five-yard line which I bet some teams wish they had at their disposal heading into every single game. Marcus Lattimore was a HS star, with that being said every school in the country wanted to have him in their backfield. Can you blame them? If you watch the HS film you will notice he’s playing against fellow draftee RB Giovanni Bernard. He was compared to Ronnie Brown out of HS so people had high hopes. 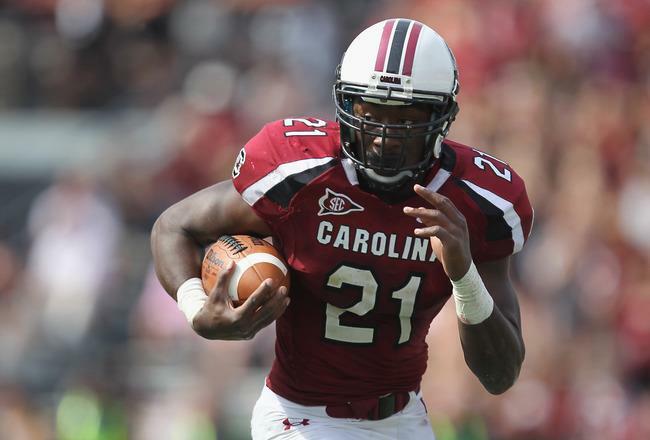 If you have watched The University of South Carolina football team play in the last three years you know that the offense went through Marcus Lattimore. Keep in mind they had QB Stephen Garcia who was inconsistent and same could be said for QB Connor Shaw, and WR Alshon Jeffrey who at best was flashy but not a guy who could set the world on fire. As a freshman in 2010 he took the world by storm, I mean not since Adrian Peterson in 2004 have I seen a freshman contend for a Heisman trophy until Johnny Manziel last season (keep in mind he was a freshman in ’10). He carried the ball 249 times for 1,197 yards for 17TD as a freshman in 2010. He also caught 29 passes for 412 yards and 2TDs. He won SEC Freshman of the Year. When you watch his highlight reel you see the sheer strength as he gets yards after contact and can do it all, he is what I label as a workhorse back a guy who gets better in a game with more than 20 carries. Plus he can do anything a RB is needed for run, catch, block, and like Boobie Miles I`m sure he can pass. As a sophomore in 2011 he started the season on Heisman Watch, Preseason All-SEC, and Preseason All American. He was my #1 RB in NCAAF heading into his sophomore season; they just landed #1 recruit JaDaveon Clowney and aimed for an SEC title and a National title. He suffered an ACL tear while throwing a block against Mississippi State. He finished the season with 818 rushing yards on 163 carries and 10TD; he also had a receiving TD. Had he stayed healthy the whole season I believe he would’ve broken the 1,300 yard mark and over 15TD. Before the start of his junior yr. in 2012, Marcus Lattimore looked to bounce back from injury and in 9½ games he had 662 rushing yards on 143 rushing attempts and added 11TD. He injured his ACL against Tennessee in the most brutal way possible. His first game back in 2012 vs. Vanderbilt he tallied 23 carries for 110 rushing yards and 2TDs in a 17-13 victory, he was the difference. McGahee bounced back from an acl tear in the 2003 Fiesta Bowl to play a long and solid career. Broncos or Darren McFadden from Oakland. Before his ACL tear in the 2003 Fiesta Bowl, McGahee was a freak of nature. McGahee came back to play 9 good years in the NFL, but look at Adrian Peterson last year. Like McFadden he shows explosion after contact. I would take him in the 1st round, his work ethic is incredible, he has a great attitude, and most of all he was productive, no running back in this draft or next year’s draft has the talent he does. People worry about health but that’s the risk you take for a talent like this. 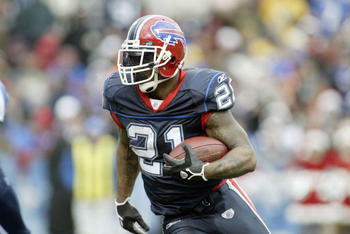 It worked for the Bills in ’03 when they drafted McGahee. I think he’ll fall to the third although some say he may go undrafted. The best team for him would be a situation where he can sit out half a season or a season to learn the system for a team that may need a running back down the road. I say a team like the New York Jets, Cincinnati Bengals or better yet the Atlanta Falcons with Michael Turner near the end . But an interesting one would be the Denver Broncos giving that McGahee maybe done and Knowshon Moreno is plain soft.